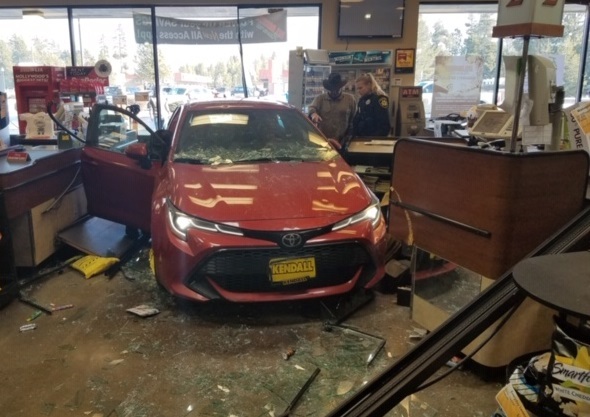 LA PINE, OR -- A 79-year-old La Pine woman reportedly mistook the gas pedal for the brake, sending her car through the front of the La Pine Ray’s Food Place, at about 12:30 p.m. Tuesday. Anita Jaramillo told Sheriff’s deputies she’d recently bought the car and wasn’t very familiar with it. While trying to park in front of the store, She drove over the sidewalk and through the front window, causing substantial damage to the building and checkstands. The store was open, but no one was hurt. No citations have been issued.